Background: In 2002 British citizen Gary McKinnon was arrested in the UK. He confessed he had hacked himself into several dozens of NASA computer systems. While NASA claims the damage done was worth $ 700.000, that claim has never been substantiated. If he were trialed and convicted in the UK, he would probably serve somewhere between community service and worst case 5 years imprisonment. Now, I don’t deny this guy did wrong and should face the courts, but the thing is, the UK never pressed charges and instead let the US do the dirty work. Even stranger is that up until the highest UK court agreed to have Gary been extradited to the US, where, if convicted, he faces a maximum sentence of 60 years. He claims he might even have to serve that in Gitmo. I have a couple of questions about this. I don’t think many countries actively deport their own citizens to a different country to be trialed there. When did this change in the UK, which I believe most people regard as having a reasonably fair justice system? What if it would have been China, or Iran asking for the guy? 60 years behind bars for some hacking? In most of Europe, you would have to have slaughtered quite a few blue eyed blond virgins. When can we expect the US to extradite a US citizen to ANY country, or super-national body like the UN? (hint 1: google ASPA. Hint 2: never). For those of you who do not follow Boing Boing (and thus already noticed): do never, ever, EVER, not when you’re guilty, not when you’re innocent, EVER talk to the police. Duane assumes no malice on the part of the police — just human failings and motivations. In a 27-minute lecture, he details the legal pitfalls people can wander into even by telling the absolute truth. This could be the best advice you ever get. The even mildest example, and believe me, invest these 40 minutes, which btw includes the counter-talk of a seasoned detective who agrees (!! ), is like: you’re driving 50 where 30 is allowed. A cop stops you and the first question he asks you is: “Do you know how fast you were driving?”. You want to be kinda honest so you say “Well officer, probably 37, 38″. Bingo! Confession! Oh, and off the record does not exist. And recordings are not required. Just that you know. Have a look, really. The justice system of my country (The Netherlands) is a bit different as a confession does not mean “no court” and we do NOT have jury justice, but still. For those in the US: Sorry! 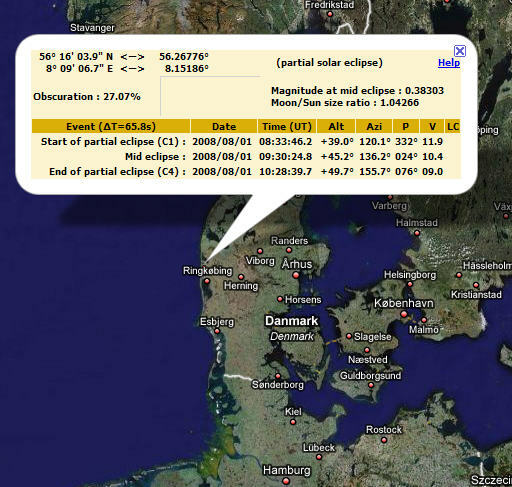 But in Northern Canada, Greenland, Northern Europe (yourp), Russia and China, next Friday is going to be solar eclipse day. I did some looking around and most maps and animations are pretty lame, if not worthless. This one though, made by a French guy (girl?) is absolutely wonderful and informative. I am in Denmark right now, and I will be able to see 26% coverage. Radovan Karadzic, one of the prime commanders in the Yugoslavian genocide is arrested. He’ll be here in The Hague soon, probably within 3 days. The camera crews are already stationed at the gate. Prosecutor Serge Brammertz welcomes the arrest today of Radovan Karadži?, the war-time President of Republika Srpska in Bosnia and Herzegovina. He was a fugitive from justice for almost 13 years – the first indictment against him was confirmed on 24 July 1995. “I was informed by our colleagues in Belgrade about the successful operation which resulted in the arrest of Radovan Karadži?. On behalf of the Office of the Prosecutor, I would like to congratulate the Serbian authorities, especially the National Security Council, Serbia’s Action Team in charge of tracking fugitives and the Office of the War Crimes Prosecutor, on achieving this milestone in cooperation with the ICTY. The date of Radovan Karadži?’s transfer into the Tribunal’s custody will be determined in due course. One down, two to go: Mladic and Hadzic. Added July 30th: He’s been transported to The Hague (Den Haag). Added August 1st: He has been brought to the court. He’s detained closby in the prison of Scheveningen (I will write about that later). You can see the opening session here (skip the Dutch introduction and start arounf 10:30 into the item). Here is the man we recognize again from the 90′s before he disappeared, not the beared thick glassed doctor we saw recently in the newspapers. Added August 7th: If you watched that video mentioned above, you already good a good look on the preseding judge, Alphons Orie. While the International Court is located in The Hague, he is the only Dutchman in the courts 32 team of judges. You will also have noted while being very polite and nice, he will, as is far more custum in our legal system than in the Anglo-Saxon system, interrupt, ask questions and be part of the trial. A good and comprehensive profile can be found here. Shortly after dawn on July 9, the local government here bused several thousand students and office workers into a public square and lined them up in front of a vocational school. As the spectators watched, witnesses said, three prisoners were brought out. Then, an execution squad fired rifles at the three point-blank, killing them on the spot. Capital punishment is barbaric, wrong, often racially, ethnically or religiously biassed. The civilization of a state can clearly be measured by their misuse of it. Have a nice visit to the Beijing games. Thanks Ruth. Warning: this is a shameless self-plug, and has nothing to do with Alaska, Politics, The world, whatever. It’s too boring and too long of a story to tell, but I needed a solid trip bookkeeping application for tax purposes on my BlackBerry, offline. And I needed to get really REALLY proficient in coding this enterprise grade smartphone (which is the main reason I was in the hide mostly for a while). 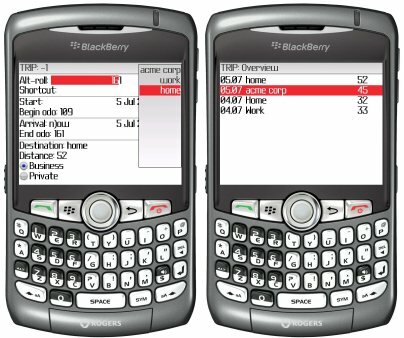 After a steep learning curve I present to you “Trip” for the BlackBerry, which I truly believe to be both robust enough to trust your data to, as wel as having a few smart goodies for making entering trips really easy. Fast trip entry through rolling the distance and having your last 10 destinations selectable. And of course it has persistent storage etc etc. If you want to have it, post a comment with your email address and I will send it to you. - odo start is odo end from last trip. Update: a lot of things have changed, ie key r immediately enters a return trip, default destination (last to one trip), bug fixes. Current version: 1.27. We are upgrading this to WordPress 2.6. Bear with me please while we’re offline on and off and while things might look “wrong”. Update: Done. Please report issues in the comment section. My friend J took a tiny detour on his motorbike today and snapped the biggest flying bird sitting on the tarmac of Schiphol Amsterdam Airport. Click for the hi res image. It’s also the only one flying. Dutch Euro-parliament (kinda congress-euro-style) member Sophie in ‘t Veld has filed a complaint in the US. She is constantly picked for further questioning (“secondary screening”) when entering the US and wants to know why. 9 months ago she requested what was on file about here, based on the Freedom of Information act. Most departments did not respond, although after pressure the state department has written to her laywer there is “something”. Her goal is twofold. First of all to show how hard it is as a normal, law abiding citizen to see what’s on record. But if course there is a more fundamental issue. The US and Europe have secretly and unofficially almost completed ironed out the issues regarding information exchange on travelers: CC numbers, meals, we’ve covered that before. There is one issue left: where does John Doe go when something is wrong with those records, which, I may add, are completely flawed in the first place. Are we safer now?